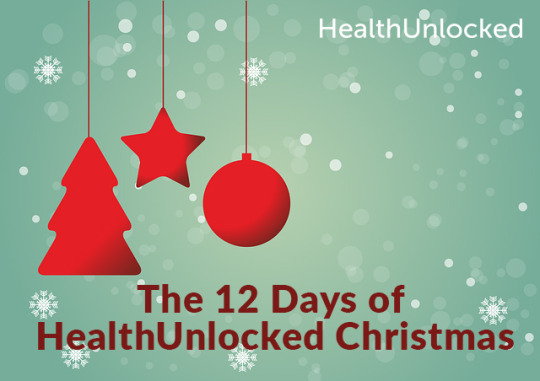 Over the past 12 days we have bought you the 12 days of HealthUnlocked Christmas. Each day we have delved into some of the diseases and conditions that affect millions of people across the world. Some you may have heard of before, whilst other health conditions may have been new to you. We hope you found it interesting and informative as you read about prevalence, symptoms and some key facts about a condition. Despite millions of people often having the same disease, many people go through their lives never meeting anyone who has their same condition. This can be very isolating and difficult. HealthUnlocked is trying to change this, bringing people with the same illness together to provide support and compare experiences at the time people most need it. Each condition in the HealthUnlocked 12 days of Christmas has its own free online support community on HealthUnlocked. What’s more, every month we are adding to this network, bringing more and more conditions to the network, supporting more and more people. Each of the featured conditions is also supported by a charity or nonprofit organisation who positively change many lives every single day, not only in their HealthUnlocked community, but in the fantastic wider work they do. We have also been collecting some health tips from HealthUnlocked users for keeping well over the Christmas period. They have included everything from making the most of all help offered to taking the time to rest when you need it. You can read them all in our HealthUnlocked community. We hope you have enjoyed the 12 days of HealthUnlocked Christmas. On behalf of HealthUnlocked we would like to wish you a very happy holiday period. See all the days and conditions.